Valparaiso Care And Rehabilitation Center is a larger-sized nursing home facility in Valparaiso. Indiana ( Porter county ). They have 164 beds and 135 residents. Valparaiso Care And Rehabilitation Center participates in Medicare and Medicaid and are classified as a Non profit – Corporation ownership. They offer residential councils. They are not located inside of a hospital. They do not belong to a continuing care community. Quality of care, ratings, services available, nursing information, and top-rated facilities can be reviewed below. 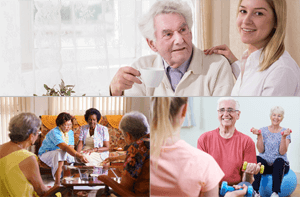 Please visit our Glossary of Nursing Home Terms if you are unsure what any of the terms and phrases used on this profile mean. Valparaiso Care And Rehabilitation Center provides an average of 1.11 registered nurse hours, 1.13 Licensed practical nurse / LVN hours, and 2.38 CNA hours per day per resident. Licensed nursing hours average 2.24 hours per day per resident. Medicare and Medicaid participation for Valparaiso Care And Rehabilitation Center began on Jan 17, 1975. The average length of stay at Valparaiso Care And Rehabilitation Center is approximately 158 days. (this may include both short and long-term care (LTC) visits). We have calculated the average cost per day for Valparaiso Care And Rehabilitation Center to be approximately $226 based off of data provided to CMS. Please note that this is only an estimate for reference and prices are subject to change. If you are interested in this facility you should contact them directly for exact pricing for you or your loved one’s specific care needs.